My parents divorced when I was young and my mother didn't want to go out to work and leave my brother and I with a minder, so she ran a small guesthouse in Tunbridge Wells. One of her long term guests was a lady called Bea. Her husband was in hospital with a serious chest ailment and she stayed with my mother because they lived quite far away from the hospital. She had a GSD, Bruce, in an outside run in the country, with neighbours coming in to feed him every day. With the onset of winter, my mum couldn't bear thinking of him all alone in subzero temperatures, so she told Bea to bring Bruce with her and he could stay in the basement. She was scared of GSDs and worried for her two small children. One bitterly cold night when Bea was at the hospital, my mum's conscience worried her about the dog in the basement. He was paralysed in his back legs (it was an obscure vitamin deficiency which was successfully treated by the Vet & he regained full mobility). So she went down there - and please remember her fear of GSDs - and picked up the big male dog, carried him upstairs and laid him in front of the fire. He gave his heart to her then. She looked after him and cared for him and saw that he was wonderful with her kids. Then Bea's husband was discharged from hospital and they all went home. My mum missed Bruce terribly, as they had such a close, loving bond. But then Bea's husband's chest got worse and the doctors advised them to move to a warmer and drier climate. My mum offered to keep Bruce and they agreed. 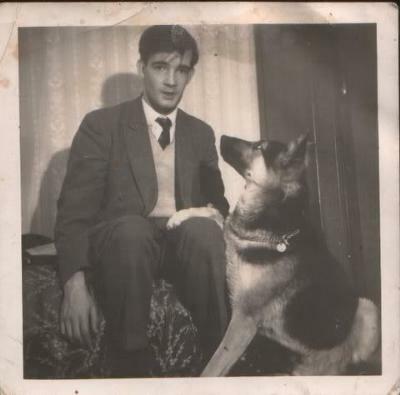 He was a prince among dogs, and completely devoted to all the family, but especially my mum. He was the dog that started a love for the breed that has continued for decades. I grew up with GSDs, as did my children as do my grandchildren. There is no finer friend anyone could have.